The Ferrara Law Firm is assisting in the representation of Louise Fraser in the case against Panera. If you have been affected by the E. coli outbreak related to Panera, contact our office immediately. Story written by David J. Neal of the Miami Herald. A lawsuit to be filed in federal court says a woman who suffered kidney failure in a romaine lettuce E. coli outbreak names Panera Bread and its romaine lettuce supplier Freshway Foods as defendants. Lawyers for Louise Fraser plan to file the suit Monday afternoon in U.S. District Court for the District of New Jersey, putting liability for Fraser’s injuries on the negligence of Panera, Freshway and unnamed others in the romaine lettuce chain. The Panera Bread restaurant named in the lawsuit is in Raritan, New Jersey, about an hour and a half northeast of Philadelphia. Friday’s Centers for Disease Control update on the E. coli outbreak placed nine E. coli illnesses in Pennsylvania, the most of any state, and seven in neighboring New Jersey. That’s the update in which the CDC advised consumers to throw out store-bought chopped romaine lettuce, or lettuce they think might be romaine lettuce, and not to eat romaine in restaurants unless it can be verified that it doesn’t come from the Yuma, Arizona, region. While the CDC said investigations pointed to that region, it didn’t name any particular grower, supplier or distributor. Freshway recalled romaine lettuce and romaine lettuce products sold to the Schnucks supermarket chain on Friday. According to the lawsuit, the salad Fraser ate at Panera Bread on March 20 included Freshway-supplied romaine lettuce from the Yuma region. Fraser began suffering bloody diarrhea and abdominal cramps, symptoms of E. coli infection, and was hospitalized from March 25 through April 9. She has been diagnosed with hemolytic uremic syndrome (HUS), a potentially fatal form of kidney failure that can result from E. coli infection. Panera’s food safety year got off to a contaminated start with a listeria-spurred recall of cream cheese products in January, but this lawsuit would be the first time its name gets linked publicly to this outbreak. Freshway, on the other hand, issued a Friday recall of romaine lettuce and romaine lettuce products sold to the Schnucks supermarket chain. That’s similar to the recall Freshway made during the 2010 romaine lettuce E. coli outbreak after an unopened product sample tested positive for E. coli. 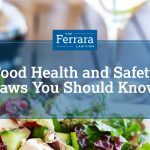 After that outbreak, Freshway faced lawsuits from several victims represented by foodborne illness law firm Marler Clark, which is representing Fraser along with The Ferrara Law Firm. Mr. Ferrara is the owner of The Ferrara Law Firm L.L.C. and is admitted to practice before the U.S. Supreme Court, the New Jersey Supreme Court, the Pennsylvania Supreme Court and the Federal Courts.